Provides a soft yellow light. 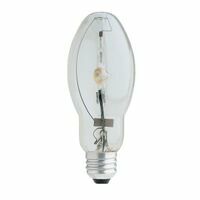 Use only in fixtures designed for this type and wattage bulb. 24,000 average life hours. Sleeved. Provides a soft yellow light. Use only in fixtures designed for this type and wattage bulb. 24,000 average life hours. 5-7/16" overall length. Boxed. High pressure sodium in retail pack. Universal operating positions. 5.43" MOL, 2.13" diameter 21 CRI, 1900K. High pressure sodium HID lamp, E26 medium base, E17 bulb, universal burn, clear, 2100K, 9500 lumens, 24000 hours, 22 CRI. 1.12? arc length (28.4mm), 2.126 diameter. 5.43 MOL. 100 watt, 55 volts. Universal operating position, warm-up time 3-4 minutes.